DESCRIPTION: Guide Price: £450,000 - £475,000. This attractive semi detached cottage is set within a semi rural location and offers an impressive range of features including two reception rooms with the sitting room having a vaulted ceiling and the dining room a log burner. 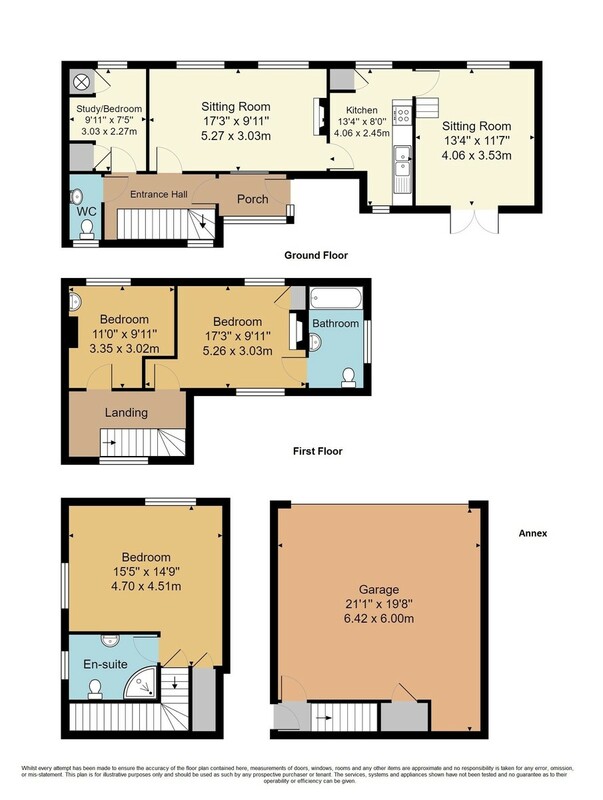 There is a downstairs study/bedroom and cloakroom, whilst at first floor there are two further bedrooms, the master bedroom having an en suite bathroom. Additional accommodation includes a bedroom annex with an en suite shower room situated above the detached double garage. Central heating is via an oil fired 'Honeywell' smart heating system with radiators and the windows have been secondary glazed, with many of them being leaded light. Externally there is an attractive Indian sandstone paved terrace leading to the property's ample off road parking and secluded front garden. SITUATION: Rowden Cottage is situated a short distance to the south of Frant village with its traditional village green, post office/general store, doctors surgery and a well regarded primary school and nursery. There are several local public houses including the Abergavenney Arms and The George. There is the nearby Eridge Park Estate which is host to a number of activities. Tunbridge Wells is the main town centre and is approximately three miles away and offers excellent multiple shopping facilities and a wider range of schools, both state and independent. For the commuter traveller there is a choice of stations at either Frant (located at Bells Yew Green) being approximately two and half miles distance or Tunbridge Wells itself both offering fast and frequent services to London and the south coast. There are good recreational amenities within a ten mile radius including a variety of golf courses, rugby and cricket clubs and Bewl Water in Lamberhurst which is the largest reservoir in the south east of England. ENTRANCE PORCH: Quarry tiled floor, built in storage unit, windows to rear, further panelled door with leaded light window , two under stairs storage cupboards, one concealing space for tumble dryer and one concealing space for a washing machine, leaded light window to rear. SITTING ROOM: This room has a vaulted ceiling, wall lighting, single radiator, window to front and French door opening to the rear. STUDY/BEDROOM 3: Window to front, single radiator, power points, cupboard housing an oil fired boiler with hot water cylinder situated above, large built in storage cupboard. DOWNSTAIRS CLOAKROOM: White suite comprising of a low level wc and wall mounted wash hand basin, window to rear, single radiator, extractor fan. FIRST FLOOR LANDING: Window to rear, access to loft space. BEDROOM 2: Single radiator, window to front, picture rail, wash hand basin set upon a wash stand, tiled surround, open fireplace, power points. EN SUITE BATHROOM: White suite comprising of a panelled bath with plumbed in shower above, designer wash hand basin with cupboards beneath, low level wc, single radiator, double aspect windows to rear and side, tiled shower area and surrounds, access to eaves cupboard, shavers point and light, tile effect laminate flooring. ANNEX/BEDROOM: This room could be used as a guest suite, teenage flat or office and includes power, electric wall heater, window to front and velux window to side, ceiling down light and built in cupboard. EN SUITE SHOWER: White suite comprising of a corner shower cubicle with electric shower, low level wc, vanity wash hand basin with independent water heater situated in the cupboard beneath, tiled surround and tile effect flooring, velux window, electric towel rail.